Today is the International Woman’s Day. I will therefore devote this blog to a favorite subject of mine: parenthood and gender-equality. Let me start by a declaration: I am an extremely privileged man. Not only am I happily married to the most wonderful and smartest woman I know. And not only am I blessed with an extraordinary healthy, energetic and funny little two-year-old. My privilege is even larger than that. Why? Well, it’s quite simple: more than having a family that I love, I actually have an abundance of time to spend with them, and in particular with my son. Historically, geographically and culturally, the concept of a stay-at-home-dad is very new, and it still is – unfortunately – extremely rare. The number is growing, but it is yet only a tiny proportion of all men who ever gets the chance to spend any significant time with their children. In almost every culture and society around the globe, women are considered most appropriate to bring up children full time, in particular small children. Some would even claim say it’s against “God’s will” or the laws of biology to do otherwise. This is all nonsense, of course. Men are just as fit and capable to raise small children as women are, if only they had the will and the encouragement. The only thing that men can’t do is to breastfeed, which is why it might be more convenient for the woman to stay at home during the first 6-12 months. But this biological circumstance gives no excuse for continuing in this way when the baby grows older. Moreover, thanks to the invention of breast-pumps, men can in fact nowadays take care of this aspect as well. 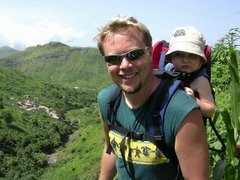 For me, the decision to take a break from my career within the Swedish Government Offices and follow my wife to Cape Verde as a spouse and full time dad was easy, and I haven’t regretted it one bit. The experience of taking care of our little guy and to see him grow, take his first steps, develop new skills and personality, learn to speak (in our case Swedish, Finnish and Portuguese at the same time) is nothing but fascinating, and invaluable. This is not to say that being a full time parent is easy. Those who might think that being at home with the kids equals leisure and fun only are very much mistaken. Changing nappies, cleaning up all kinds of mess, making baby food and having to get up in the middle of the night to comfort a baby can sometimes be very tiring. What is more: the level of responsibility is immeasurable. Being responsible for a baby’s or a toddler’s safety, sustenance, clothing, hygiene, physical and psychological development etc is a HUGE task. The predominating idea that paid employment is somehow more important or valuable to society than raising kids is completely flawed. To be a full-time dad anywhere is great. But to be a full-time daddy in Cape Verde is even better. During my first paternal leave, when we were living in Belgium, I was responsible for almost every home duty, including cleaning, dish-washing, cooking etc. This would be the normal situation for the parent staying at home. As expats living in Cape Verde however, it is almost compulsory to employ a housekeeper. This means that I am liberated from many of these ordinary obligations, and I can therefore concentrate even more on fatherhood. Moreover, we have employed a babysitter who takes care of our little one now and then. This gives me some free time which is normally a very rare luxury in this area. Thanks to this, I benefit from all the advantages of being a full time dad, while still finding some time of my own, for instance to write a few blogs. So, what are the downsides of being a stay at home dad in Cape Verde? I can only list a few, and they all have to do with other peoples prejudice and expectations. For instance, at times I have received surprised stares, laughs and comments in the streets of Praia when taking walks with the baby pram. I remember two women once passing by who even offered their help to take care of the baby. Also, quite a few people who have been unaware of our family situation have taken for granted that I am the one with a job, and addressed my wife as a housewife. I must confess that this is a bit annoying. Other than that, life as a house-daddy is not difficult here. It should be obvious by now that I am quite proud to be a stay-at-home-dad. And I call on all fathers to try it on for size for as long as they possibly can; ideally to (at least) the same extent as the mother. If you are working, take parental leave. If you are unemployed, take full responsibility for the kids for a while. And if you somehow find that being a full time father is incompatible with your opinion of what a man should or shouldn’t do, get over it! It’s not worth loosing your time with your kids just because of an obsolete prejudice. I’m telling you, you won’t regret it. It is a true privilege to be a full time dad. Ulf, I got to know about your blog thru my friend Debora Bear. I know her from my Chicago days but currently live in Sydney,Australia. I've made a move similar to yours following my wife and totally agree with you that dads must take time off to take care of their kids and those who don't are missing out. I was lucky enough to take care of our son Octavio (he's 2 yrs-2 months) for 4-5 months when we moved last year and I was intentionally "jobless."